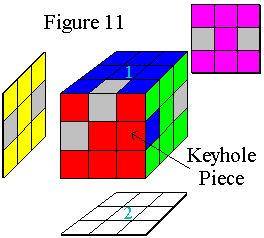 Orient the cube as shown in Figure 11 or Figure 12, depending on how the keyhole piece is oriented in the middle horizontal slice. If the keyhole piece is already in the keyhole but oriented incorrectly, simply move it out by using Move 3 or 4 (it doesn't matter which) and go back to step 4. If the cube looks like Figure 11, then Move 5 will put the piece into place. In words, rotate the front side (red here) one quarter turn clockwise, the middle horizontal slice (between the blue and white sides) one quarter turn counter clockwise (so that the red/blue corner piece moves toward the back), the front 1/4 turn counter clockwise, etc. If the cube looks like Figure 12, then Move 6 will put the piece into place.